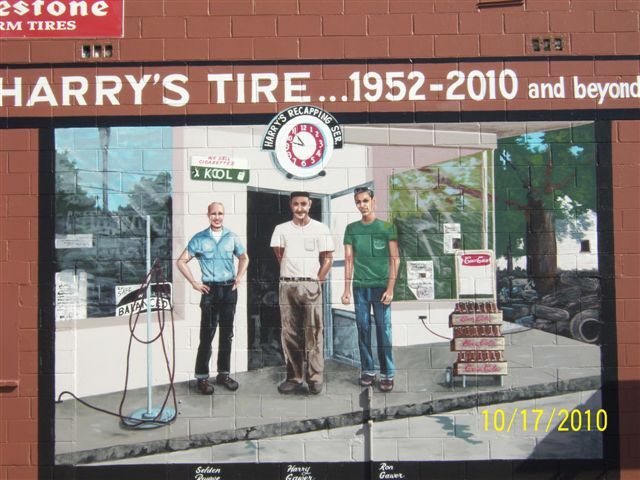 I have painted many murals over the years. I only have seven pictured on this website. 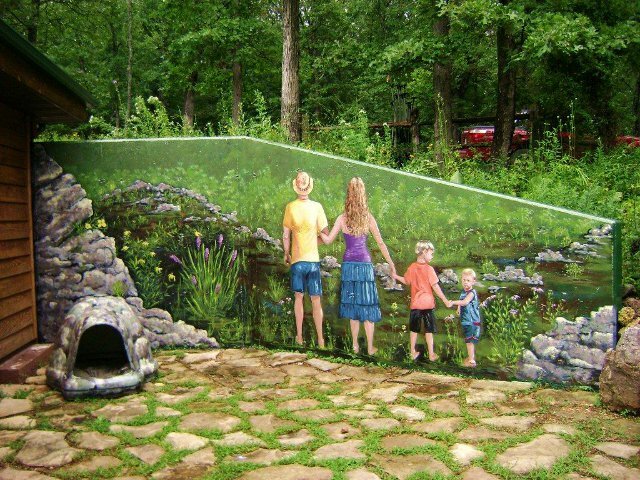 The second was painted in 2004 in Sullivan Missouri.the size is 12 1/2 ft. by 62 ft. I use 40 year warranty paint on my murals finish with a graffiti proof sealer. My murals have a lasting beauty. I will travel farther than 50 mile radius to do murals with certain specifications. I have also painted many murals for churches and private homes as well. The third mural was painted at a private home. Is 8’x7′. Painted on concrete wall. Scene is a slightly opened old time door with a little wood gnome peeking out. Brick and vines wrap about and a little flower fairy, and tree nymph fly joyfully. The fourth mural was also painted at a home residence. It is 7’x19′. It is actually a family portrait from the “backside” as requested, looking out unto what they all love nature and wild flowers. This is a mural that I completed in July of 2014. It was derived from a photo taken around 1911. 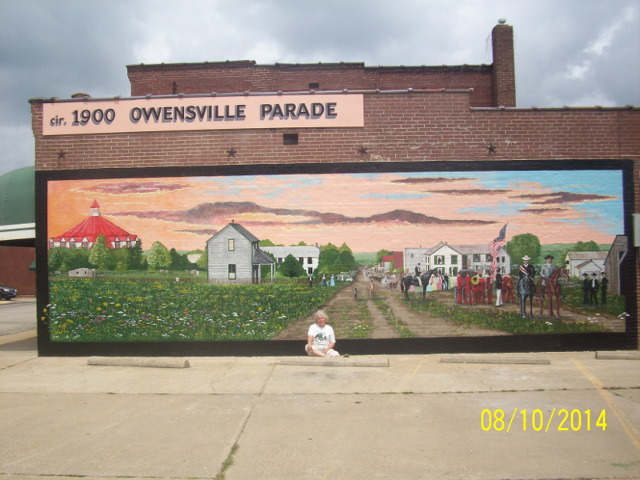 A very large “Parade of all Parades” with the intention of getting more people interested in the town of Owensville. 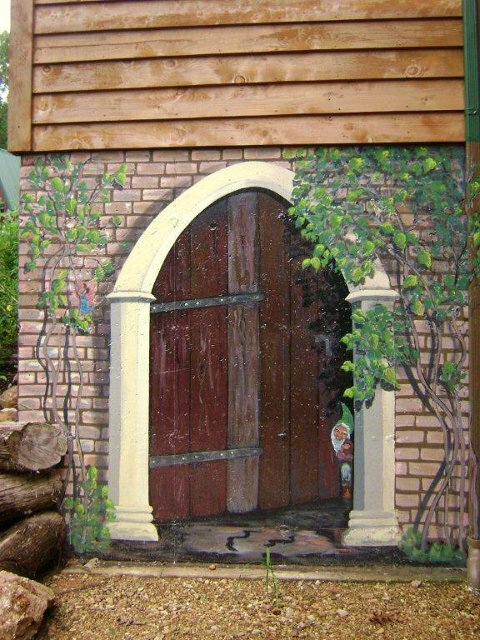 Painted on a refinished brick wall, sized at 10 x 36 feet. 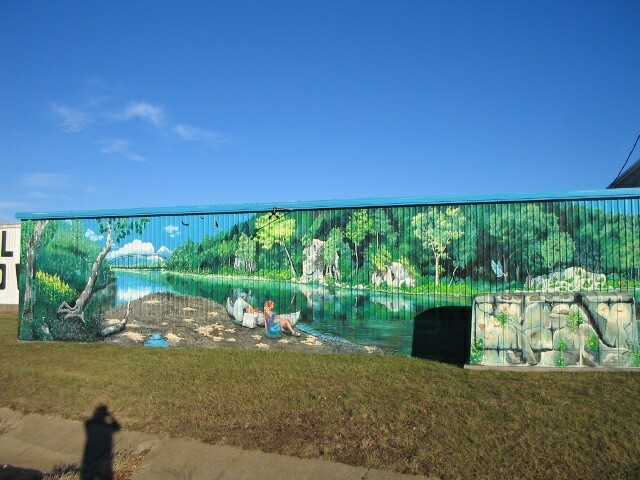 This mural was painted in 2004, At Sullivan Mo. on the bowling alley building facing Hwy. 44. It is a scene of the Meramec River depicting the old Sappington bridge and canoeist of the 70’s. Is 8’x7′. Scene is a slightly opened old time door with a little wood gnome peeking out. Brick and vines wrap about and a little flower fairy, and tree nymph fly joyfully. It is 7’x19′. It is actually a family portrait from the “backside” as requested, looking out unto what they all love nature and wild flowers.